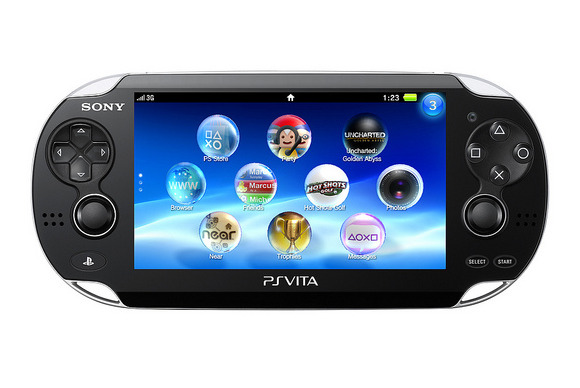 Sony's focus is on its PlayStation Vita handheld at this year's Tokyo Game Show. Japan's premier game event has lost a bit of its luster and is noticeably smaller than years past, as many companies focus on the larger E3 that takes place in the summer in the U.S., including Nintendo and Microsoft. But Sony has fielded its usual sprawling display at the event, a two-story complex with over 70 PlayStation Vitas, dozens of PlayStation 3 consoles, and a special section devoted to its new PlayStation Mobile endeavor. On center stage at the display is a large section for attendees to try out the PlayStation Vita, which is making its first appearance at the show since its official launch last year, with over 70 units available for trial. Sony is featuring two main capabilities of the handheld, group play and augmented reality, and gamers lined up for over an hour to try one for a few minutes. The lines are expected to grow considerably when the show, currently open only to press and industry insiders, opens to the general public over the weekend. Gamers sit at low tables with booth attendants in groups of four, battling it out on the new Sony title Soul Sacrifice. The new red and blue versions of the Vita announced last week are among those on display. In a separate area, games using augmented reality are on display, including Puls-AR, in which the user steers a laser around the screen by positioning reflectors. The position of the reflectors in the game is set by physical cards read in by the Vita's camera, so gamers must hold the device in one hand and peer through the screen while they move the cards around, a difficult combination to master. In Table Play Ice Hockey, similar cards can be used to assemble a hockey team and compete with other Vita users. Sony has also developed a special mystery game for gamers that bring their own Vitas to the booth, which they download to their devices and use to unravel virtual clues. Gamers that want to try PlayStation 3 games can do so using the company's head-mounted display, which can create a virtual screen comparable to something you'd see in a movie theater. The new slimmed-down PS 3s that go on sale later this year are not available for gaming, but a few are on display behind glass. Sony is also showing how the Vita can be used to link to a PlayStation 3. In a demonstration using the title PlayStation All Star Battle Royal, two Vitas are synced with a PS 3. Video and game action stream smoothly in real-time between the devices, which are connected with a physical cable. Sony is also promoting its new PlayStation Mobile platform, which opens a new online store next month. The platform will let approved devices from manufacturers like HTC and Sharp play games developed in a PlayStation-branded environment, and handsets from HTC and Sharp are on display, as well as Sony's own Xperia phones and tablets.